If Fellini were filming his satirical portraits of Italian life today, surely, his characters would be absorbed in their mobile devices searching for the “digital sweet life.” Yet, in one of the most ancient of all cities, the connectivity of our fast-lane, telematic communications has redirected the search for love and happiness. While walking the streets of Rome (and most cities of the world for that matter), the circulation of digital messaging has inserted itself front and center into the stream of everyday life. 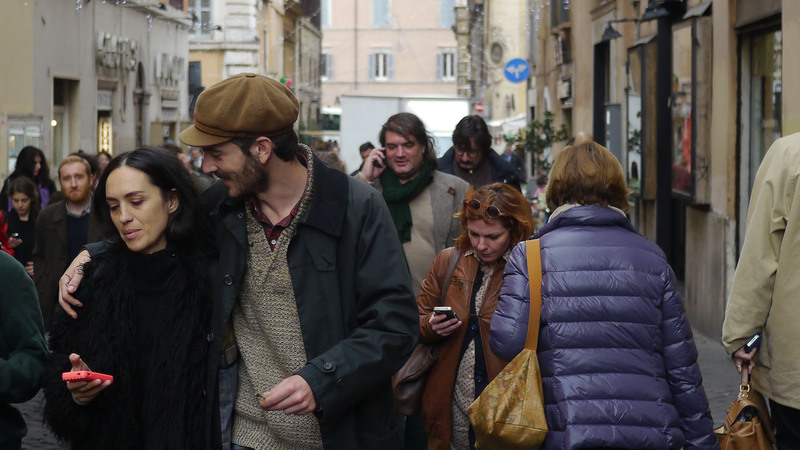 While strolling the historic Via dei Giubbonari, just off the Campo de Fiori in the old, historic section of Rome, the inhabitants are displaced, caught up in a remote exchange with someone a mile away or perhaps on the other side of the globe. No matter: forget about the romance of the cobble stone streets and stone buildings of a charming Roman neighborhood dating back more than a thousand years. We live in the distributed NOW, tethered to the digital impulses of the ever-present present racing through our devices and our nervous systems at the speed of light: the Internet as the new circus maximus. In today’s Roma and the never-ending pursuit of la vita and its meaning, we find ourselves caught up in a new meaning, a new aesthetic, a new romance with la vita digitale, the fast-paced, quick-cut reality that no doubt Fellini would have embraced as a portrait of life in today’s Rome as a telematic city.